Yeah so the headaches continue. Is it because I am pregnant or do some DIY’s just don’t go as planned for others too? Cause I know this is my first rodeo in many regards but I do feel a bit like Camus pushing the giant boulder up a hill, except I’m doing it 6 months pregnant and way more out of shape. This week we got the hardware on with the help of a friend, thank you Charlie! It looks amazing BUT even after the sealing we got hairline cracks where they were installed. It’s only noticeable close up but I will have to touch that up eventually (as in like maybe next year). Even though we pre-drilled the holes and then affixed them the old fashioned way (with a screwdriver) to be as gentle as possible we still got them so that was rather frustrating. We also got the walls sanded and painted where we ripped down the cabinets and even that had a few bumps! One small area must have had a strange sealer cause paint literally peeled off like plastic. Only this would happen to me! On the other hand I will say the natural sealer I talked about in the previous post seems to have stopped the chips! So one small win. Now to the migraine. These floors! My orginal plan was paint & stencil. Only after some thought I really don’t want to cover up the nature texture of the travertine. No, it's not in the best shape but I do not mind the character, I just mind the yellowish color especially when my countertops have that and I can’t get rid of them… yet. So I read some bloggers (and by some I mean like 2) having success with staining travertine since it is such a pourous natural material. They mentioned actual wood stains penetrating better than those made for stone so I went to the source and just got a straight up undiluted black dye that also was fairly non-toxic. WELL when I diluted it turned PURPLE, cue me crying. Purple floor no thank you! So then I went with the straight dye and well that was a winner! UNTIL after curing for 24 hours one drop of water and it came right up. Cue more crying. Now I have not tried to seal my experiment tiles but I am not very confident that it will prevent the dye from lifting either are two professionals I talked to. Also the sealer is pretty damn toxic and I hate respirator masks and the whole growing a human things turns me off from that since the tiles were sealed previously its truly not necessary and would mean my first step would be to remove the old sealer with acetone prior to adding the dye also pretty toxic. So now I am sort of back to square 1. I think my hunch to try and keep the natural stone texture is the right call. If you like at my inspo images from Devol Kitchens they don’t do fancy patterned tiles they go classic and I already have that I just don’t have the right color. I feel setback a week now with trying to come up with another game plan so if you have any advice for me I will gladly take it! That is my wrap up for week 2 for the spring 2019 One Room Challenge and click the link to see that of the other guest participants as well as the featured designers. How do I get my floors like one of these Devol Kitchen floors? 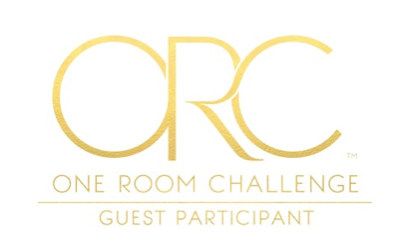 Well, folks I’m taking the plunge head first as a guest participant in the One Room Challenge and am incredibly excited as well as a bit overwhelmed, considering I moved into our first home less than a week ago! The thing with this home is we bought it without a doubt for the location and the yard. Both really couldn’t be beat for our needs. While I would love a true fixer upper this place is more of a refresher. It’s been updated but the style is already outdated, think late 90’s early 2000s even though it was probably done in the last 6-8 years. Given that we just spent our life savings this ORC is all about working with what you have. 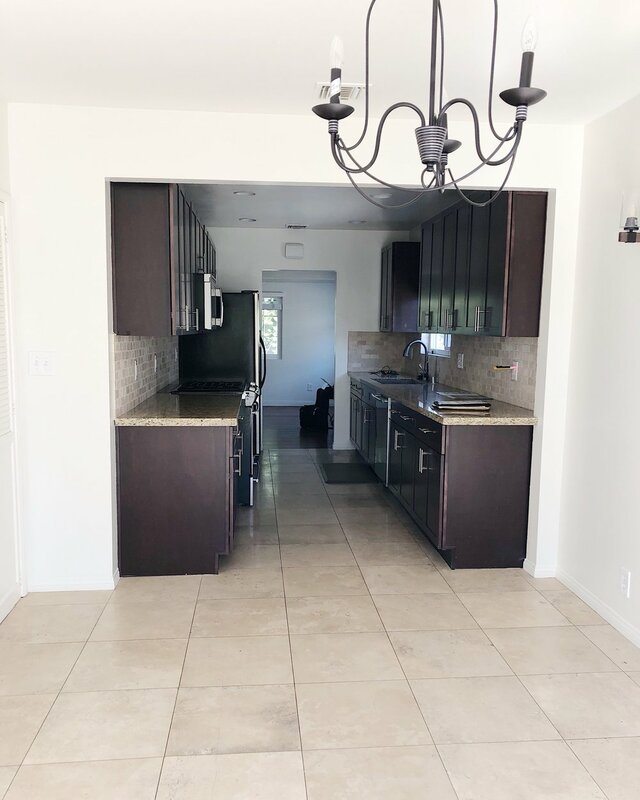 While we were hoping for a more open concept I was happy to see how wide this was for a galley and how large of a space there was for a breakfast nook. I was also excited to see the existing cabinets were shaker style and that to me was very doable. 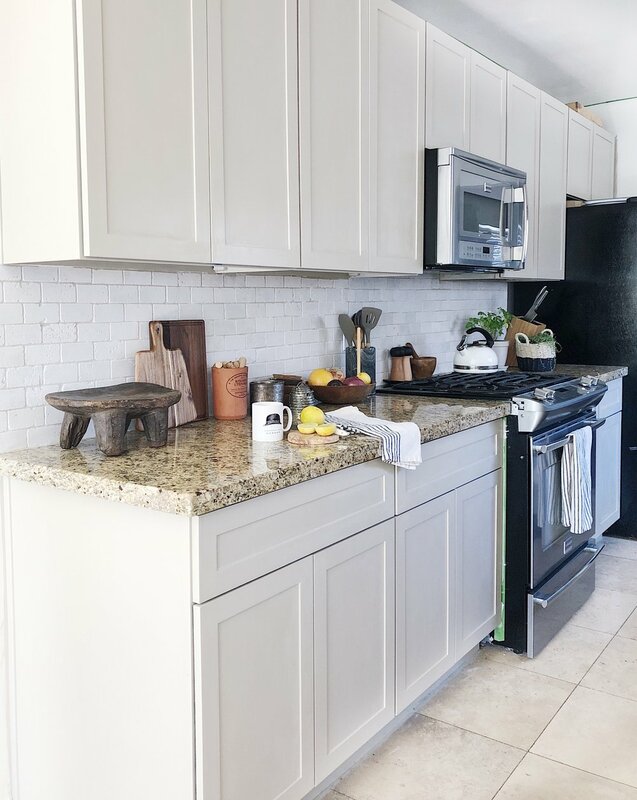 Also while the backsplash and floors are colors I would never choose their texture suits me and so I was relieved to feel like all of this was workable without any major renovations but just some DIYs. Plus a place for a chandelier and a pair sconces had me excited for the possibilities to make my mark on a home for the first time being a life long renter previously. What to address first? The cabinets obviously. They are too dark and they are cramping the style of the lovely window. So we plan to take out all the uppers on the right side and replace those with open shelving then paint the rest and re-hardware them. No easy task but the cost is minimal comparatively and while it takes work its more elbow grease than hiring a contractor. What we will have to keep is the counters, they’re granite and in great condition so while a far cry from my dream of quartzite or marble, for now the goal is to draw your eye away from their yellowy brown look. Here are the plans for the kitchen which are heavily influenced on blending my love of English charm, which happens to be where my husband is from, and our mutual love of classic clean design with a twist. In short I am heavily influenced by the incomparable Devol Kitchens. For the generous breakfast nook I will be building a large bench under a window against the wall so I can accommodate, the probably too big for the space, but HOLY AMAZING vintage Baker Furniture Neo-Classical dining table that I scored for under $200. It's a beast but it can accommodate from 6-12 people which will come in handy when we celebrate the holidays etc. While she needs some TLC I love the idea of having a vintage piece that I can use as the main staple to this space and have the rest of the elements be a more modern version of some classic designs like some black Windsor chairs or a chandelier inspired by the great MCM designer Florian Schulz. It the end this space will encompass what I am all about. Which is not having one style but layering many seamlessly to create one of kind yet classic designs. I design less for buzz words or trends but more for a reflection of who the people who live in our home are and I hope to show you that. So there you have it. My plans for the spring 2019 One Room Challenge and click the link to see that of the other guest participants as well as the featured designers. It's a large undertaking but I already have on hand some amazing brands that as a designer I have come to know and love on board to help me execute it. I feel honored they have entrusted me to show off what I have long respected about them in their use with clients into my own home. I hope you enjoy this journey with me and that I can impart some wisdom as you rethink your own home and how we can up-cycle and refresh what we have without losing sight of the dreams we had for our homes. Well folks if you are like me you enjoy the long holiday weekend ditching everything and anything labeled Black Friday and look forward to a Cyber Monday as a way to avoid the crowds but still score some deals. And to get you on your way I have rounded up my top gifts for him, for her and for little ones. I have included small businesses, big brands, and quite a few shops that give back! From your big gifts to stocking stuffers I got you covered! When it comes to keeping your home from looking like the children took over is to stick with the larger items in neutral colors than you can avoid having your spaces look like a classroom instead of a home. And when it comes to toys if you buy cute toys than you won’t mind if they are left out! 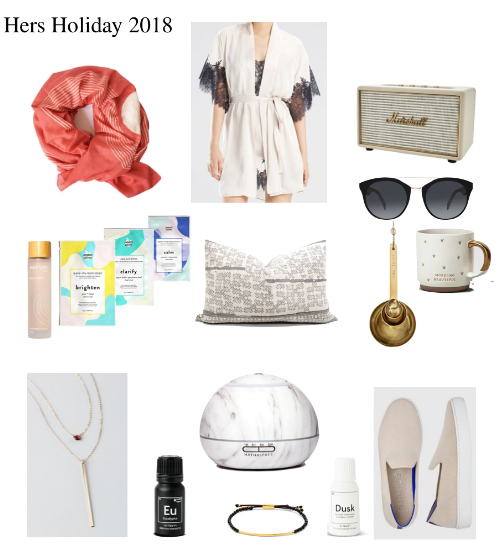 Whether you are like me and don’t know what you want for yourself or you are looking for the besties/ sister/ mom any special women in your life here are some picks to get you started from healing energy jewelry to self care at home with essential oils and face masks. I always like to include one or two items that put a handmade stamp on the holiday like a mudcloth pillow to brighten up her work chair or reading nook and a cozy scarf that doubles as a work of art! And when it comes to the men that get us going or keep us going whether its your father, brother or boyfriend find some special gifts that let him feel like the man he is. Think leather and items that encourage him to get outdoors. Nothing says “I love you Honey” like some strong coffee and whiskey! Happy gifting and don’t forget something yourself! And if there is any kind of guides you would like to see in the future let me know in the comments!